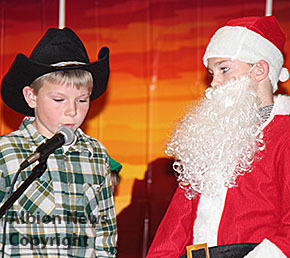 Enthusiastic performances highlighted the annual Elementary Christmas Program at Boone Central Schools last Friday, Dec. 11. The program included a holiday play, Christmas at the O.K. Corral, performed by fourth and fifth grades. Above, The “Candy Cane Kid” (Hank Hudson) confers with Santa Claus (Ben Reilly) about how to stop Bubble Gum Bart from ruining Christmas in Snowy Gulch. More photos in this week’s Albion News Print and E-Editions.